Margate’s gluten free restaurant, the Ministry of Pies, will close at the end of this month (January 31) due to a lack of trade. Boss Gary-Paul Derriman says the New Street venue, which also has a wide vegan menu, is no longer viable due to a lack of people in the town. Gary-Paul, who previously had a restaurant in The Knott pub in Westgate, opened Ministry of Pies three years ago but says the business in its current form will now have to end. 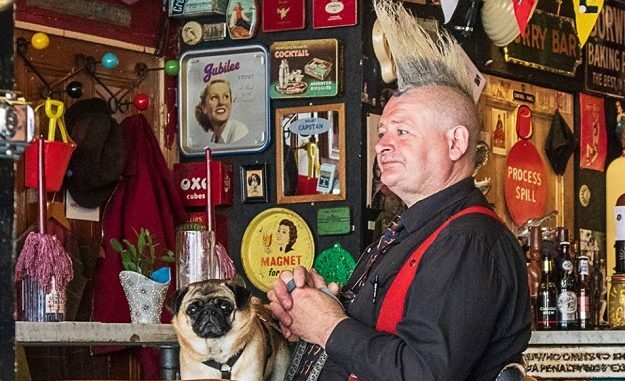 The businessman/chef, who is a well-known figure with his striking outfits and Mohawk haircut, says his next move may be to take his business into one of the isle’s pubs. The 61-year-old said: “It is purely down to a lack of trade. There is no footfall in the town, it is just not viable. Takings are down 40-50% on the last three months of last year. People just aren’t shopping in the high streets. They are online or pop to Westwood Cross and have something to eat while they are there. The stepdad-of-two, who lives in Cliftonville, says he is now in talks with people about the possibility of moving base into a town pub. Gary-Paul will also be shedding his famous Mohawk this month in the name of charity. He will be having his hair and eyebrows shaved off on January 24 at Fez in the High Street to raise cash for the RNLI and Macmillan Cancer Nurses. His pal Michael Saxby will also be undergoing a charity shave. The honours will be done at 7pm by Westgate’s Snip’s Barbers. To donate pop into Fez, Ministry of Pies or pay directly to Halifax, Hair Cut 2019, 11-71-80 05377460. Not surprising sadly-the number of actual Coeliac sufferers is like Lactose intolerance very minute, most people just jump on the free from bandwagon to be cool. Once the novelty for them wears off they are onto the next fad. Others just have IBS & assume they cannot process Gluten. There was a piece on a news show last week about a meat restaurant very close to a Vegan cafe selling Vegan sausages or suchlike & people buying them like crazy-a real Vegan or Vegetarian would not be anywhere near a place like that-so obviously it is another fad people are jumping on. Steve, I don’t think you are far wrong. I wish you all the very best. Sorry to say but your pies were just awful that’s why you had no business.